DVD Synopsis: A terrified young baby-sitter... an incessantly ringing phone... and whispered threats set the stage for one of the most suspenseful chillers ever filmed. Carol Kane stars as the baby-sitter who is tormented by a series of ominous phone calls until a compulsive cop (Charles Durning) is brought on the scene to apprehend the psychotic killer. Seven years later, however, the nightmare begins again when the madman returns to mercilessly haunt Kane, now a wife and mother. No longer a naïve girl - though still terrified, but prepared - she moves boldly to thwart the maniac's attack in scenes that culminate in a nerve-shattering conclusion. 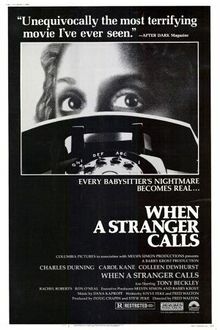 The first 20 minutes of When a Stranger Calls, when babysitter Carol Kane is being harassed by a crazy man on the phone, are absolutely nerve-wracking. It's as intense an opening sequence to a film as I've ever experienced. After that, the story changes gears a bit and becomes a game of cat-and-mouse, with private investigator Charles Durning doing everything he can to track down the mad caller (superbly played by Tony Beckley), culminating in a finale that ratchets the tension right back up to the level of the opening scene. There's a lot to like about When a Stranger Calls, from it's engrossing story to the performances of it's leads. But what really caught my attention was the musical score of Dana Kaproff, which was especially effective in the opening sequence. Even without much happening on-screen (the music drums its way through shots of the telephone sitting on the table, the empty stairwell, and the locked door), the tension remains at a fevered pitch thanks in large part to this nail-biting score. It proves a vital element in a sequence that will stay with you for a long, long time. Hi Dave, I liked your review and am inspired to see the film. I also like your challenge of 2500 films. I've got a new challenge to review all the Tucson-made films I can find. Jean: Thanks for stopping by, and for the comment. WHEN A STRANGER CALLS is definitely a great horror film, and one I recommend without hesitation.